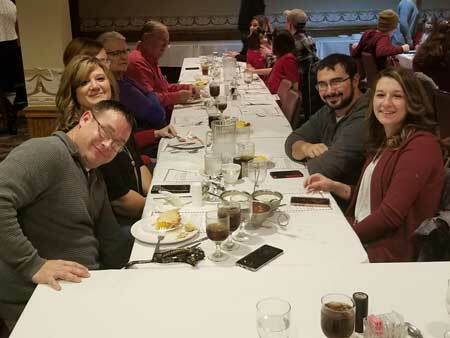 ALGER — The USV Alger EMS held their annual “Christmas & Appreciation” Banquet on Saturday, December 1st at 6:00 PM at Henry’s Restaurant in Kenton. EMS Chief Doug LaRue welcomed the team and their families and thanked them for all of their hard work over the past year! Your community appreciates all that you do to keep all of us safe and sound when the call for help goes out. We have had many accomplishments over the past year and are on task again to break our record of over 500 EMS calls and special events this year! This is quite remarkable for a department made up of 16 dedicated volunteer EMS members. Chief LaRue thanked the Executive Team which consists of Assistant Chief Robin LaRue, Lieutenants Terri Burkett and Andrea Helton for their hard work as well. Chief LaRue thanked the clerk, Joyce Campbell, for all of her hard work and also the support they have receive from the USV Ambulance District Board. Joyce was presented with a gift card for all of her hard work. You are so appreciated Joyce. Chief LaRue also thanked the community for all of their support with the department! I can’t say enough great things about our community and how they always go above and beyond to support us. Chief Doug LaRue and Assistant Chief Robin LaRue presented each EMS member received a 2018 Alger EMS comemmorative pin for their dedication to the department as well as a gift from the USV Ambulance District Board. Special awards and recognition were also given out as well. The Vickie Ward EMS Memorial Award was given to Alicia Roberts. Denny Ward, Vickie’s husband was also on hand to present this award to Alicia. Alicia displays the mission and values just as Vickie did. She would be very proud of your hard work and accomplishments Alicia. The most squad runs award went to two members as they both have responded and are tied at 251 EMS calls or 51% of the calls. Curtis Engelhardt and Jodi Gibson received this award. The USV Alger EMS Provider of the Year went to Jodi Gibson. Chief LaRue said that this was selected by your peers and you should be proud. You have given a lot to the department and our patients truly love you. Jodi is always willing to help with special events. Members inducted into the USV Alger EMS honorary member wall were Joanne Engelhardt, Karl Engelhardt, Donna Guyton and Carol Pickford. Chief LaRue said they were a vital part of the department and we don’t want to forget how we started. Members inducted in the USV Alger EMS Business Supporter of the Year were Alger Village Council and Padrones of Ada. A plaque was also given to Padrones of Ada for all of their support of the department. They truely are a supporter of Public Safety and it shows every time we place an order their from the department. They always go out of their way just as all of those do that are on this plaque. We could not do it without our businesses in the region. I am very proud of how they always help us when we call on them. Many area businesses are currently on this plaque. To close, Mr. And Mrs. Claus brought gifts to all of the kids that were present which was a hit! A gift was given to an elite member of the department, Mr. Troy Fry. Mr. Fry’s spirit is quite remarkable. He knows everyone’s radio number, where we respond, which squad we take, etc. He is so amazing. Troy was very excited to get his new Alger EMS shirt and I am sure he will wear it proud. I have never seen anyone get so excited when a squad radio goes off. Troy is ready to respond. Although he doesn’t go on squad runs, Troy looks forward to going in the parades. All members and their families had a great time at this year’s event. Henry’s did an outstanding job with the food and venue once again. If you would like to become a member of the USV Alger EMS team, please contact Chief Doug LaRue at dlarue45@yahoo.com. We are always looking for members to join our exciting team!